The ignition switch must be on for the turn signals to function. 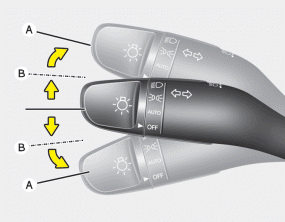 To turn on the turn signals, move the lever up or down (A). Green arrow indicators on the instrument panel indicate which turn signal is operating. They will self-cancel after a turn is completed. If the indicator continues to flash after a turn, manually return the lever to the OFF position. To signal a lane change, move the turn signal lever slightly and hold it in position (B). The lever will return to the OFF position when released. If an indicator stays on and does not flash or if it flashes abnormally, one of the turn signal bulbs may be burned out and will require replacement. To activate an one-touch triple turn signal move the turn signal lever slightly for less than 1.8 seconds and then release it. The lane change signals will blink 3 times. You can activate or deactivate this feature. Refer to “User Settings” in this section. If an indicator flash is abnormally quick or slow, a bulb may be burned out or have a poor electrical connection in the circuit.